It's 33 degrees, snowy, and breeze outside. I have bronchitis and a sinus infection. Today Rich decided we need to put halters on Mango for the first time. This involves first, herding all of the girls into the barn and closing the door (sounds easier than it is) and secondly, cutting out the designated animal from the herd. The second part is actually the easier part of the operation. Today the girls definitely weren't hungry enough to come into the barn voluntarily when we put out some of their favorite snack, sweet feed. They also seemed to sense that something was up as I sat shivering on the edge of the hay rick with a scoop of sweet feed in my hand, not very patiently trying to coax them deeper into the little red barn. Rich was messing about with the feed boxes just outside the gate. I am convinced they realize when there are two of us hovering about with determined looks on our faces that they will soon be the object of some awkward attempt to corner and restrain one of them for something unpleasant. We tried for about 15 minutes and gave up. I went inside, took off my barn shoes and prepared to relax on the couch when Rich stuck his head in the back door and shouted, "They're all in the barn." He quickly slammed the door and retreated to the barn without giving me a chance to respond. A very wise move on his part. He knows me so well. Muttering some unrepeatable epithets under my breath, I suited up again and stomped out to the barn. This time we were successful. First we haltered baby Mango for the first time ever. She bucked a bit at first and then just stood her ground facing us down. She even took a step or two after she calmed down. We took off the halter and released her. Then we cornered her mama, Took, who calmed immediately when we put the halter and lead on her. Rich was able to lead her around in the barn and out into the snow covered pasture. She clearly was experienced at this. This morning we took a quick trip out to Amy J's Homestead Alpacas where we purchased our four girls. We needed to pick up a special blend of sweet feed and ask a few questions about alpaca coats, medication and a few other topics. As always Amy was so patient with us and readily and cheerfully answered all of our questions. We were so lucky when we chose to visit her farm during our research phase of this endeavor. She is the best mentor we could have ever chosen. She honestly answers any question we ask from care of alpacas to tax questions. We are so thankful for this association. While there we visited the animals in the barn. I snapped a few pictures of the most darling crias in their winter coats snacking at the feed bin and nursing from their moms. Labels: Rich luring baby Mango with some sweet feed. All of the meteorologists at all of the major television stations predicted blizzard conditions for today, and although we here in Seneca County Ohio are on a level 2 snow emergency I really wouldn't consider it a blizzard. For a short time today it snowed heavily and there is some wind but it never reached the constant 35 mph that constitutes a blizzard. We probably have about four inches of snow and it is blowing and shifting. 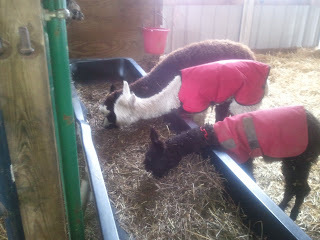 Rich and I went out earlier to check on the alpaca girls who are locked safely in the barn today. We spent some time letting them eat sweet feed from our hands. Rich shoveled out the small pile of "beans" that they had deposited. The small barn is a tight, warm shelter from the winds. It smells pleasantly of hay and warm alpacas. It's a nice place to spend a half hour. In the short time we were out in the barn with the girls the wind had filled in our footprints in the snow drifts between the house and barn. It was a good night for soup so I cooked up a pot of cheesy corn chowder for supper and served it with pulled pork sandwiches made from the leftovers of the Sunday celebration. We have probably six inches of snow and may get more tonight. According to the weather report we should have some more blowing and drifting. Rich and I are warmly settled in for the night and looking forward to the two creme brulees left from Christmas dinner at Amy's. I truly think that "life is good." We tried and tried to get the girls lined up for a Christmas picture and this was the best we could do. They absolutely refused to wear the Santa hats or neck garlands. I think that they were trying to let us know that they had way more dignity than the dog who happily wore her plaid, jingle bell collar all day at the family Christmas gathering out in our little studio/store. Richard's side of the family gathered here Sunday; forty odd children and adults from under a year old up to my father-in-law who is 83, packed the little red barn studio for our annual Christmas celebration. This year both of our daughters, my son-in-law and the three grandkids were able to join us, too. It is a rare occasion when we can get the family all together like that. We missed our nephew who had to work and was the only one missing. Our two granddaughters stayed all night with us that evening. Zaidee, eight, who was in from Oregon with our daughter, Susie, had a wonderful time with her cousin, Olivia, 14. Zaidee looks up to Olivia and adores her. Olivia is so patient with the little ones. It was an early Christmas gift for me. Then on Monday we drove to Columbus to rejoin our daughter Amy, and son-in-law Steve, and favorite (and only) grandson, Max, to stay overnight and open gifts this morning. Steve is an excellent gourmet cook and made deep dish pizzas for dinner last night. Yummy. Unfortunately his grandmother was suddenly taken ill and he had to go to Toledo to see her in the hospital and missed the dinner he had planned for today. Amy, Susie and I managed to carry on and get dinner on the table. We all enjoyed the day in spite of the shadow of his grandma's illness. We hope and pray that she will be well soon. Rich and I arrived home late this afternoon in time to batten down the hatches because a blizzard warning is in effect for tomorrow with the snow starting tonight. Rich managed to corral the girls and lock them in the barn for the night. They weren't happy about that and kept looking out of the barn door window, but we will rest easier knowing that they are in out of the wind. Merry Christmas to everyone, from Buckeye Star Alpaca farm! Early this morning, before the sun came up, Rich and I went out to the barn to feed the girls. We also had plans to corral them in the barn while they were eating in order to single each one out and administer a medication called Panecure. The lab report from the vet indicated the Firenze has some sort of intestinal parasite and we had to treat all of the girls in case the others had picked it up. Rich went out first and put feed in the bins. While the girls were eating he slipped out behind them and closed the barn door. I came out soon after, still in my pajamas, with the medication and syringe. I filled the syringe with a single dose and with arms outstretched I helped Rich herd the girls into the corner. He cut out Firenze from the pack and grabbed her gently but firmly around the neck. She quieted down immediately and didn't resist very hard when I inserted the syringe full of medication between her lips and down into the back of her mouth. She swallowed some of it and drooled some more out. No problem. We just cornered her again and gave her another 1/2 dose. We repeated the process with Leeza then Took. Leeza was as compliant as Took was resistant. Took really did not want to open her lips for me and I had to be a little forceful. In the end she swallowed and all was well. Corralling Mango was a bit more difficult. She clearly has not had medication administered to her very often but once we got her pinned and I gave her the meds she actually smacked her lips and seemed to like it. This small triumph was a real confidence builder for both Rich and I. Before this we weren't at all sure that we would be able to corral them all so easily. We are now looking forward to haltering Took and Mango this weekend to begin lead training for the baby girl. Every day is a new adventure and a new challenge. Sometime in the mid-morning I had to turn off the television. I couldn't watch any more news reports from the Sandy Hook Elementary School shooting. I had first heard of this horrible, horrible event yesterday when I checked the news during my lunch period. There were no details then and I couldn't afford to know any more about it since I had two more classes to teach and I didn't trust myself to remain positive and upbeat to the kids I was responsible for at the time. Then when I returned home in the afternoon I tuned in to the news and the awful details were everywhere. I couldn't hold back the tears for those twenty children and their teachers. We have had to deal with the death of students at our school in the past and when something like Sandy Hook occurs it stirs the ashes of those past emotions and makes them surface again. I couldn't fall asleep last night for thinking about all of those lovely, innocent children and dedicated education professionals who tried desperately to protect them. I'm a teacher. I'm a mom and a grandma. As I sit here in my cozy living room, in front of my festive Christmas tree and look at the pictures of my own three, beautiful grandchildren, two of whom are still in elementary school themselves, I cannot help but think of the deep sea of grief that will be replacing the high tide of joy for the victims' families this holiday season. I mourn with them and my heart goes out to them. For the past two days I have been so busy after school that I have been late getting home and therefore have not been able to spend much time outside with the alpaca girls. I am really missing that unwinding time that I spend with them each evening. Last night, after dinner, I did go out to the stable briefly to feed them the extra helping of sweet feed that the vet recommended. We did a body score on all of them Sunday (more about that later) and found that Firenze is a bit under weight and Took, also pregnant at the same time she is sporadically nursing Mango, could use a little extra nutrition. I scooped up a generous helping of the feed into a large, red, plastic feed scoop and stepped into the stable enclosure. As soon as the girls heard me snap the top off the plastic feed bin they rushed into the stable area. When I stepped through the gate and turned around Firenze was right there at my shoulder waiting with the other three close behind. I took a handful of feed out of the scoop and held it to my left as I held the scoop to the right of me. Firenze zeroed in on the largest portion in the scoop and the other three jostled for the handful on the left. The most amazing thing is that Leeza, who was the timid one before Firenze arrived, pushed in ahead of Took and Mango and helped herself to the feed in my left hand. Eventually I had to shoulder Leeza out of the way so that I could give Took the extra handful. This is the first time that I have had all four of the girls crowding in close to me to get their snack! Sunday afternoon, one of my students who is also a 4-H member, came out to visit and become familiar with the alpacas. She would like to show one of them at the fair next summer as her project so I invited her to come out and begin to work with them. We felt that it was time for the recommended periodic body score. This involves corraling them into one place, in this case the stable, and one of us holds them steady while the other runs their hands over the animal's back to check for muscle mass alongside their spine and all down the back. My student, Rich, and myself herded the girls into the corner of the stable behind the hay rack. Rich grabbed Took around the neck and the 4-H'er and I felt down the length of her back. But baby Mango surprised all three of us when she did a standing leap over the 3' tall hay rack and out of the corner into the open space! She wasn't going to hang around and be pawed over by any humans. We finished off the body scoring with Leeza and Firenze then decided to halter Leeza and work a bit on leading her around with a leash. With a little hesitation at first, Leeza cooperated and we had a successful training session for both girl and animal!